One thing the archaeologists tend not to do (although that is not an exclusive tendency) is to try to interpret the meaning of the symbols. There are many, many theories as to the meaning of the triple spiral (should that be the triple double spiral?) 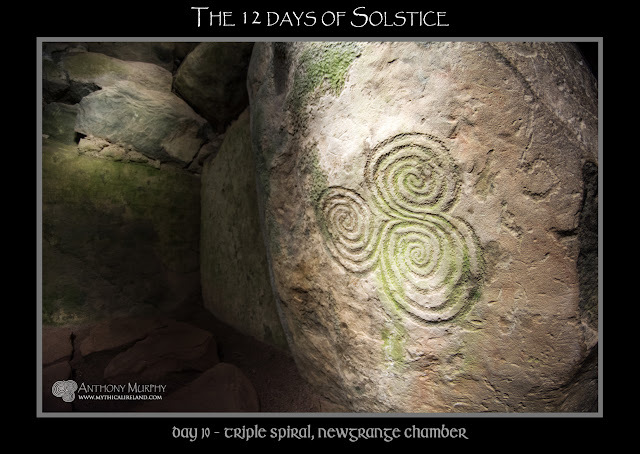 Its position within the end recess, but on a side wall, means that, contrary to some speculation on the internet, the winter solstice sun beam does not strike it directly. Rather, it is illuminated by reflected light. So what does it mean? Does it mean anything? My own speculation has revolved around the mythology and the astronomy of the monument. In myth, there are two significant "trinities", or trios of figureheads. Tochmarc Étaíne (the Wooing of Étaín) is believed to have been written in the eighth or ninth century AD, but the true genesis of its story cannot be known. It describes how Dagda, the chief of the god, the Tuatha Dé Danann, desires Bóinn (the goddess after whom the River Boyne is named). He sends Bóinn's husband Elcmar away and lies with Bóinn and they conceive a son, Oengus Óg. So we have father god, mother goddess, and divine offspring. The second trinity consists of Lugh, Dechtine and Sétanta. 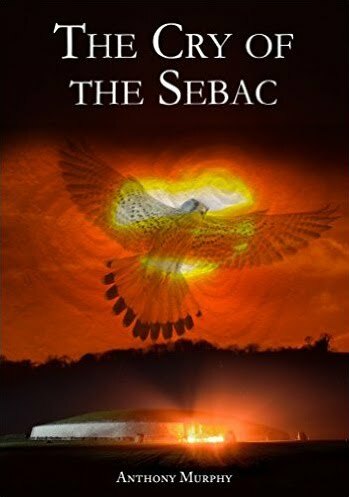 Dechtine comes to Newgrange in wintertime from Emain Macha (Armagh) and while there Lugh (another of the chief gods) appears to her in a dream and tells her she will bear a son, and that he will be called Sétanta. Sétanta later becomes Cúchulainn. Perhaps the triplicate of spirals represents the trinity of gods? Separately, we find that several heavenly objects cast their light into Newgrange. One of these, as we know, is the sun. Each year on Winter Solstice, the light of the rising sun enters the long corridor of Newgrange and shines into its inner chamber. What is much less well known is that sometimes the full moons in summertime shine into Newgrange. Further to this is the fact that Venus, as the Morning Star, is said to cast a beam into the chamber of Newgrange once in eight years. (1) O'Kelly, Michael (1998) , Newgrange: Archaeology, Art and Legend, Thames and Hudson, p177.